I appreciate all the support so far! I am pretty confident I have got my macros sorted out. I just want to make absolute sure I am eating the right amount of calories as well because don't want to set myself up to fail. I have used Scooby in the past. And this part always confuses me. Please bare with me! I used Scooby this morning to calculate based on my weight today. It says my BMR is 2274. 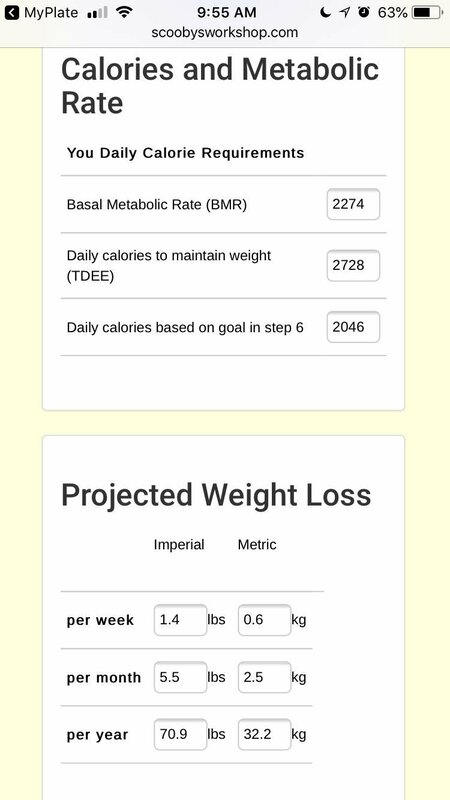 So if I want to reduce calories by 25% I would need to eat under my BMR at 2046. TDEE is 2728. I set it to desk job little exercise. When I enter in sedentary for the live strong app it tells me to eat 1726 for a 2.0 lb loss per week which about a half pound more per week than the Scooby calculation. I love the idea of 2.0lb weight loss per week but it is significantly eating under BMR and I know there are different opinions on this. I really want to be successful. I don't know where to set my calories. Do I use the Scooby calculations or do I reduce the calorie restriction to 20% on Scooby to eat above BMR? What is your age, height and weight? Didnt you het a ton of great advice a few days ago? Here are my thoughts (I'm using clinical terms and it is in no way a judgement or rude). When you are obese, you can eat below your BMR for a short time. You don't need to feed your fat. 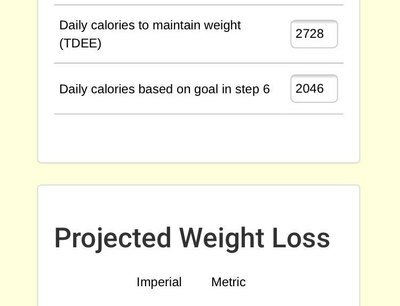 I would manually set this app to 1800-2000 calories a day--any number would be fine. I would eat about 80 grams of protein a day, net somewhere under 150 grams of carbs a day (and I mean fruits and veggies, no bread/pasta or rice) and the rest will be fat. You will need to manually adjust your macro goals once you determine your calorie goals. Sagers yes I did but it had nothing to do with calories. It was about macros. My doctor tells me eating under BMR will slow my metabolism so I am trying to be careful. I don't think it's possible to get too much advice. I have definitely struggle with disordered eating all my life and my metabolism is probably all messed up since my mom put me on really unhealthy diets at the age of 9. I am trying hard to correct that by getting good information and advice to set myself straight. To me knowledge is power. When you know better. You do better. Restricting calories slows your metabolism. Intermittent fasting and weight lifting will improve it. You can also google reverse dieting. Im pretty sure calories where discussed also.......alot of people put off starting, because they want to figure it all put first, but there so much to learn......its best to start and tweak as you go, which maybe rhat what your doing? Either way, good luck to you! I started a couple of weeks before I came back on. I am down 14 lbs so far. Scale is 319 this morning and my clothes are starting to feel a little bit looser. I started at 333. I get confused when it is said that restricting calories slows metabolism but eating under BMR is ok especially for the obese. I thought obese people already had slow metabolisms and that's part of why they have so much excess weight. This part has not made a lot of sense to me. So if someone was only 50 lbs overweight they could eat above BMR? I have been intermittent fasting for the last year. I do at least 14 hours. But most often it's about 16 hours. I don't do it every single day probably 5 days a week but it's been fairly convenient when I am busy in the morning. I have backed off the weight training I was doing while my body is adapting to these new changes to macros for now. I do plan on adding the exercise back in next week. So is there some sort of restriction on how many questions you can ask about a topic? BMR is not a stable number and many things influence it. I'm 25 years older, little bit shorter and at a healthy weight--My BMR is around 1400. As you lose weight, your BMR is going to come down also. It takes less energy to maintain a body at 153 pounds than it does at 320. Obesity is about hormones and hormonal imbalance. Keep in mind that your body has to work harder, even at rest, than someone who is at a lower weight. There is no limit on the number of questions you can ask. So if my body needs more energy to run my body is it a good idea to eat under BMR? I do know it changes as I lose weight. I do have hormone imbalances. I have done an extensive test (Dutch test) to figure out what's going on. I have high cortisone levels and also high cortisol levels. Like sky high in the morning specifically. I also don't get the best quality sleep. Which affects everything too unfortunately. Stop snacking! Every time you eat, you spike your insulin. Insulin is the fat storing hormone. Eat 2-3 times a day. You got some great advice on that post to help you time your food intake better. Where did I say I was snacking? It might have looked that way with the way I track. Yesterday sucked. The majority of days I only eat 2 large meals with a snack in between. Usually the lunch or breakfast is blank. Yes, you can eat below your BMR. Also, for every 30 pounds you lose, you need to go back to Scooby and check your numbers. At some point, you will probably end up eating about 1500-1700 to get the last 20 off. On your accountability post, you tracked 3 meals and snacks and the largest amount of calories consumed was snacks--so just going off your tracking page. I am usually awake 17-18 hours a day. I find timing my meals difficult. That's why I have used intermittent fasting to help because it's just such a long day to spread meals out over. 2. This ain't rocket science, but it's not an exact science either. As long as you continue to move forward, you'll be fine. Ya the "snacks"were all in one meal. I had a kind bar in the morning because I was actually legit hungry in the morning and had no time to make anything. And then when I went to go make a good lunch my power went out. Yesterday was a mess! I can only prep food about a day in advance as I also have some histamine issues going on from so eating freshly prepared foods is important. Can you make egg muffins and freeze them? Pop them into the microwave when you are in a rush? How about Plain Greek yogurt with some raspberries/blackberries/blueberries tossed in? Can you preboil some eggs and eat those?